Pasta del Giorno. Casarecce, Silver Beet and Chickpeas. My best meals are usually spontaneous and unplanned. Ingredients present themselves from the Spring garden: I wander about, basket in hand, and pick a few likely candidates to make the Pasta Del Giorno ( pasta of the day) while Mr T digs out a cheap, light red wine, to go with it. He does most of the hard physical labour in the orto, carting wheelbarrows of compost about or making fences and mowing grass, so a proper lunch is in order most days. I add a few pantry staples and a new combination is born. Today’s pasta takes around 20 minutes to prepare and cook. Meanwhile, have a munch on these radishes while I boil the pasta water. Pasta del Giorno. Casarecce con bietola, acciughe, e ceci./ Casarecce pasta with silver beet, anchovies, and chickpeas for two or three people. Another budget dish that is deeply satisfying. Recipe for two or three. 4 medium-sized young silver beet leaves including stems. In a heavy based deep sided frying pan, add the oil and stir fry the garlic and anchovies together, mashing the anchovies as you go. Add the chilli and finely shredded silver beet leaves, stirring well. Add a handful of chickpeas to the mixture. Turn heat down to very low or off until the pasta is ready. Meanwhile cook the casarecce pasta in a large pot of salted water and as per packet directions. Keep a cup of the cooking water, then drain the pasta OR, simply scoop out the pasta with a large wire strainer and add to the frying pan of sauce. The second method retains enough liquid to loosen the sauce. Turn heat to high, then toss around in the frying pan, distributing the ingredients well. Season with black pepper. Consider adding a little more oil or cooking water. 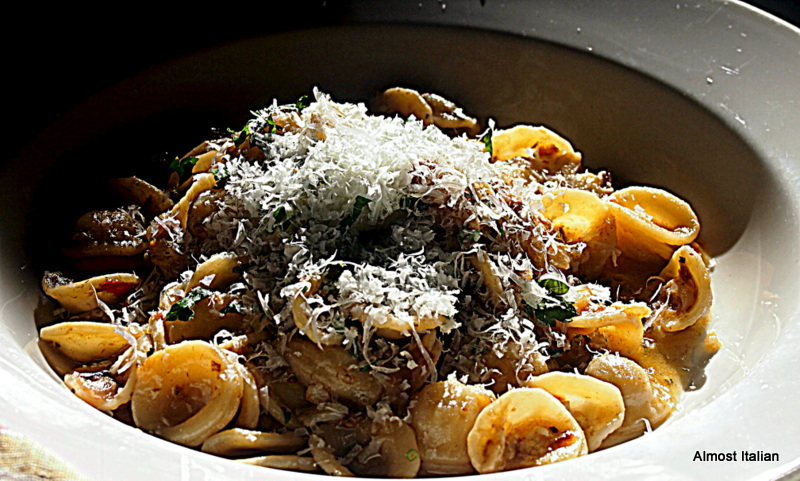 Serve in hot bowls with grated parmigiano. Salute! ‘Delizioso….no way are the chooks getting this’ quote Renato. The Bossy Stuff or Basics for Beginners. Start with a flavour base for your sauce. Each soffrito should match the ingredients and the season. Don’t overload your pasta dish with too many ingredients. Choose around 2-3 main ingredients to star in the sauce. Choose a pasta shape that will match or showcase your ingredients. Consider how to make your sauce wet. Short, fat pasta shapes are hard to digest if the sauce is too dry. Save some of the cooking water at the end to add to the sauce. Time the cooking of the pasta and taste it for doneness. Al dente or to the tooth means a little undercooked and not too soft. Remember that the pasta will continue to cook when added to the sauce. Always heat the serving plates. 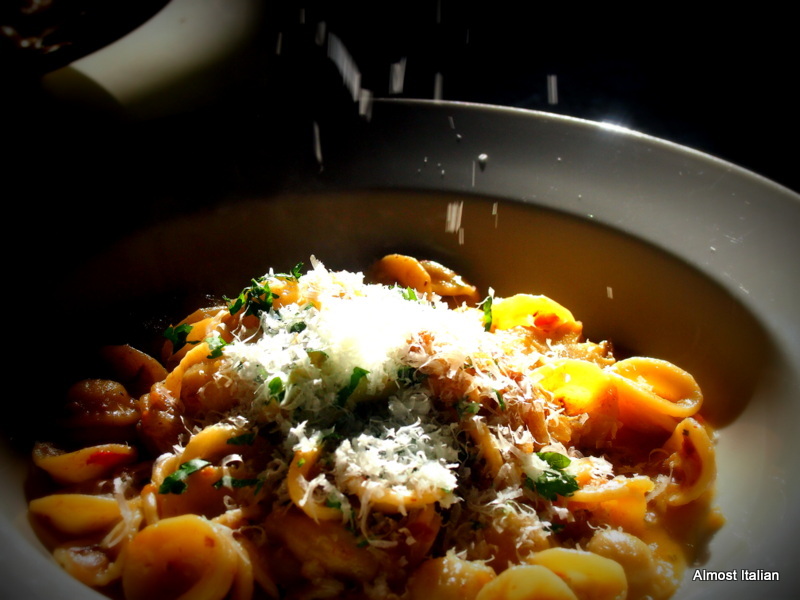 A good pasta meal can become instantly cold through the omission of this step. Use large shallow bowls for serving. Large deep bowls are better for Asian noodle dishes. Small ‘old school’ bowls are good for breakfast cereal. Posted on November 11, 2016 November 11, 2016 Author FrancescaCategories Budget, Italian Culture and Cuisine, pasta, RecipesTags anchovies, bietola, budget, casarecce, ceci, chickpeas, pasta, recipe, silverbeet, soffritto, vegetable garden20 Comments on Pasta del Giorno. Casarecce, Silver Beet and Chickpeas. I have to be honest, coming home from a long holiday in the tropics to Melbourne hasn’t been easy. It’s not just the cold weather. The first week back home has been hectic, full of dinner catch ups, missed family birthdays involving cookathons, garlic planting, entertaining our Italian guest, visiting and cooking for Mother, a football match to attend, and more. The days just seem too short, yet a mountain of tasks towers ahead. 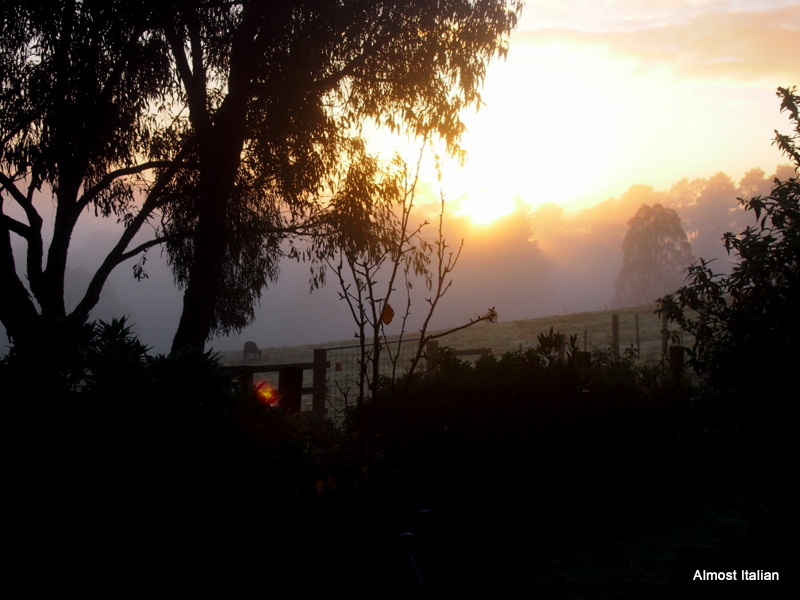 I am looking forward to a slower pace and some space to catch up with things. 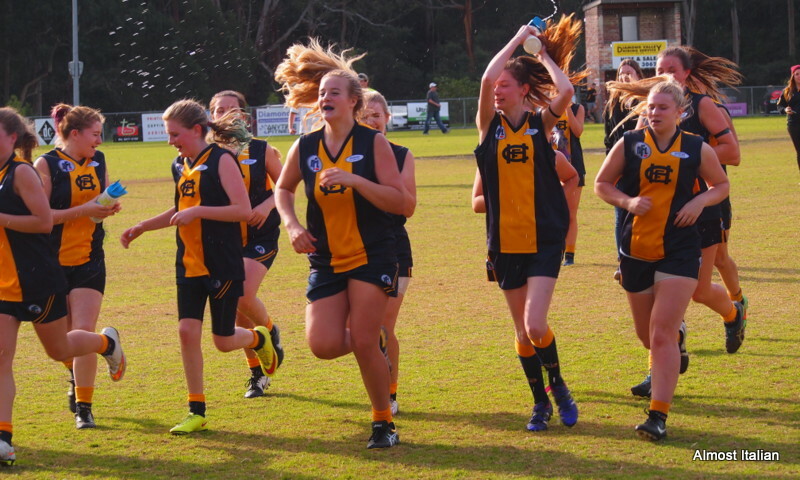 Although I don’t follow football, I admire these girls who played so well for their local team, Hurstbridge. Cold weather routines are slowly re-emerging. Vegetable stocks go on the stove, barley or beans are soaked as I mull over the next week’s budget meals. On sunny days, the low-lying sun streams through the north facing windows, warming the house in the middle hours of the day, reminders of the effectiveness of passive solar energy in house design. Mr T gathers dry kindling and wood from the shed to feed our two wood stoves. Last night’s left over hot ashes become roasting beds for Autumn eggplants. On our second day back, a late crop of pine mushrooms popped through the deep litter of pine needles, providing a tasty topping for bruschetta. 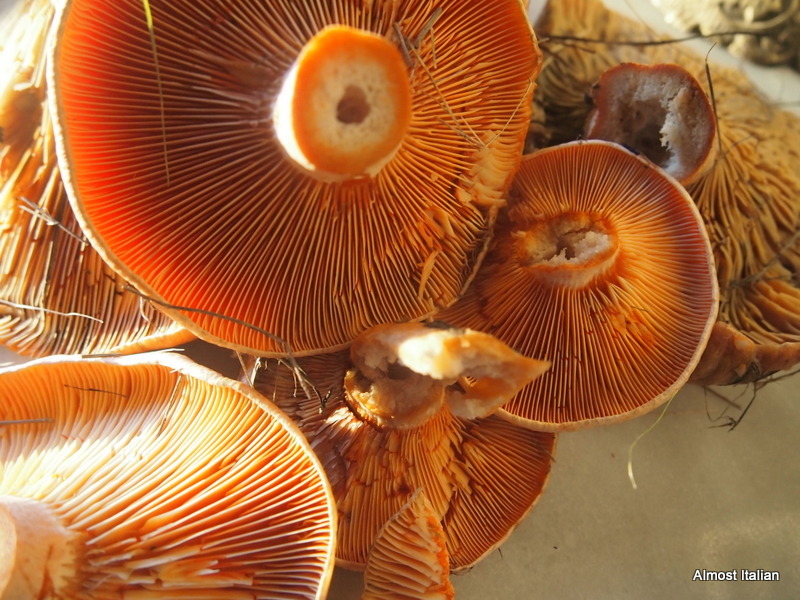 Alberto searched for more along the ridges but found none, only the toxic Fairy rings of Fly Agaric. Foraging for food is always such a pleasure. Annual crop of Pine Mushrooms for Bruschetta. Although a few days remain before Winter officially commences, today’s pasta, Pasta d’Inverno or winter pasta, is a nourishing dish to go with these times of low light and slow pace. Quantities suitable for two hungry people. finely sliced cauliflower, around one quarter of a head. Boil a large pot of water for the pasta. Salt well and then add the orecchiette and cook according to packet instructions. Meanwhile, heat the olive oil in a medium-sized frying pan. Add onions and cook very slowly and gently until they soften and almost melt, without colouring, then add the garlic and anchovies. Stir these about for a minute or so: the anchovies will vanish into the onion mixture. Add a small amount of freshly chopped rosemary. Add the sliced cauliflower to the onion mixture and toss about for a few minutes until it is softened. Slicing cauliflower allows it to cook faster than small florets. I like the way it disappears in the sauce. 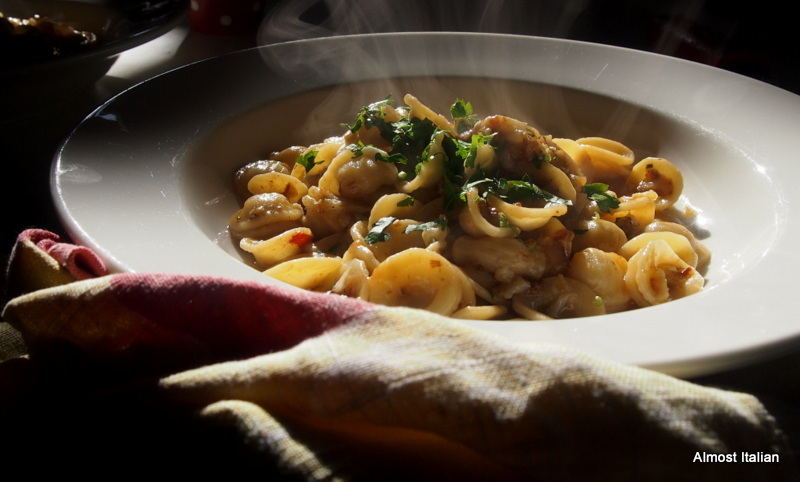 When the pasta is nearly cooked, remove at least a cup of the pasta water. Add this to the onion mixture, turning up the temperature to reduce a little. Stir in a few tablespoons of the grated parmesan to thicken the sauce. Drain the pasta and add to the pan to amalgamate well with the sauce. Add the finely chopped parsley. Serve in heated bowls, adding more parmesan at the table. There should be plenty of unctuous sauce to mop up. Involtini di Melanzane. Stuffed Eggplant Rolls. Eggplants are so versatile. I am always excited by their possibilities in the kitchen. Common in Mediterranean and Middle eastern cuisines as well as those of India, China and South East Asia, the spongy flesh of the eggplant readily soaks up other flavours, especially olive oil. Melanzana, the Italian word for eggplant or aubergine, is the most shady looking member of the deadly nightshade family, solanum melongena, and the Italian name, melanzana may follow from this or is derived from mela insana, which, translated into English, means mad apple. 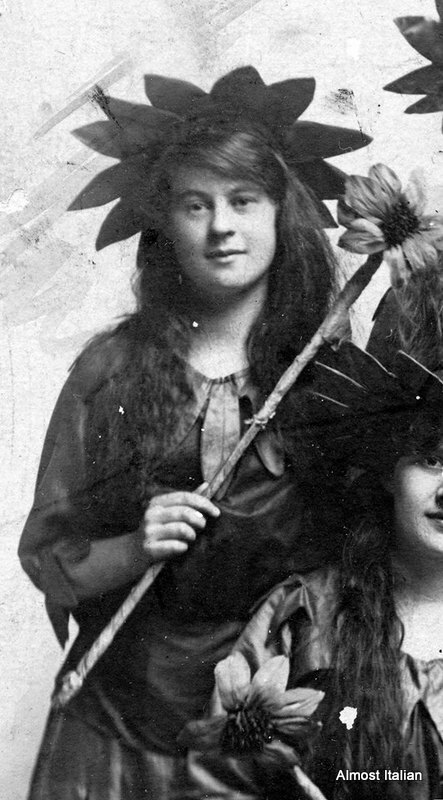 The latter may have some validity as most Europeans were fearful of members of the deadly nightshade family (including tomatoes and potatoes) and this particular member looks pretty scary! It can be purchased all year round but the best specimens arrive in my garden and in fresh produce markets in Autumn. When fresh, as distinct from stored, stashed, sprayed and imported, the flesh is white and seedless – there is no need to salt them at all. My seedlings were sold as the Bonica variety and while slow to mature, they produce lovely elongated but fleshy fruit. 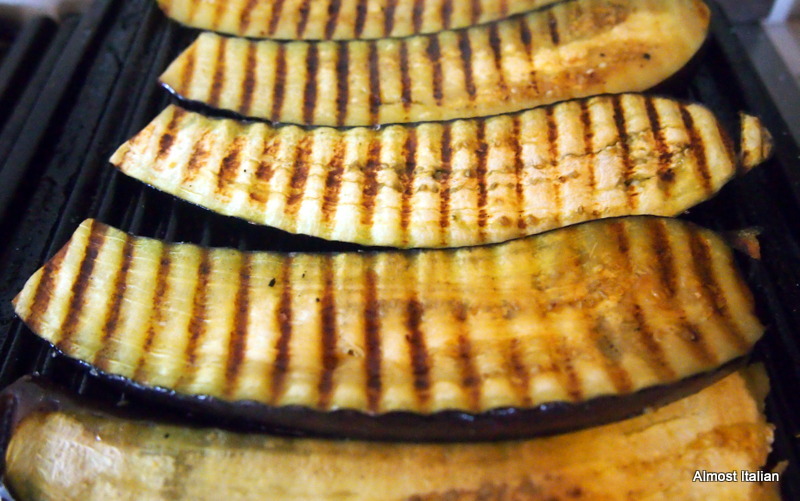 Brush the eggplant with oil and grill. Nice and easy. Last week when Debi at My Kitchen Witch explored the role of breadcrumbs used as condiment (conza) in Sicilian cooking, I was reminded of a wonderful Sicilian eggplant recipe from one of my favourite books, My Taste of Sicily by Dominique Rizzo. ( Lantern, 2011). This is a gem of a book and I am slowly working my way through it. Grilled eggplant ready to rock and roll. I can recommend this little dish if you have all these goods on hand, as I did. Oh happy day! 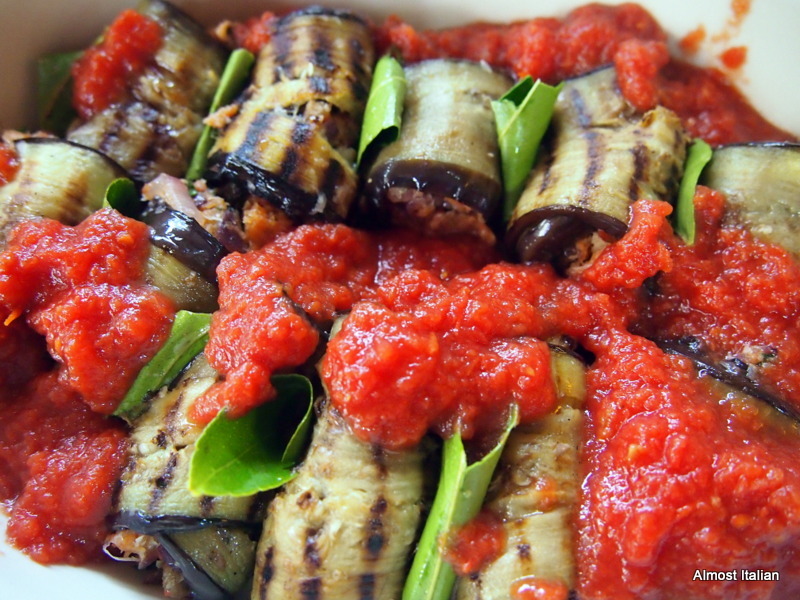 Involtini di Melanzane – Stuffed Eggplant Rolls. Serves six as a side dish or entrée, or 3-4 as a main with another side dish. 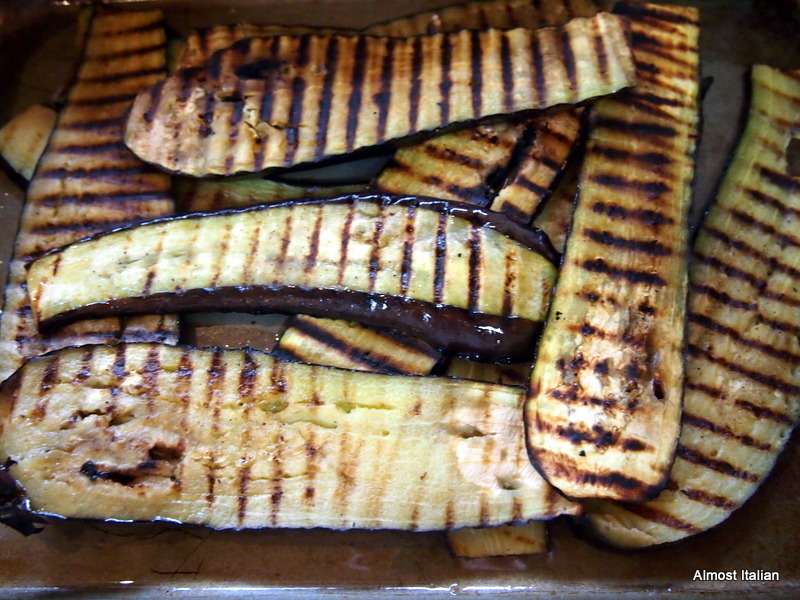 Brush the eggplant with oil, season with salt and pepper and grill on a flat iron stove top griller. Alternately, place on a baking tray and bake for 15 minutes or until golden. For the filling, heat the olive oil in a frying pan over medium heat and saute the onion and garlic for 2 minutes or until softened. Add the anchovy and stir for 1 minute, then add the capers, parsley, tomato paste, and a little water. Season to taste with salt and pepper and cook for another minute. Remove pan from the heat and combine with the breadcrumbs and pecorino: the mixture should have a thick pasty consistency. If the filling is too wet, add more breadcrumbs. 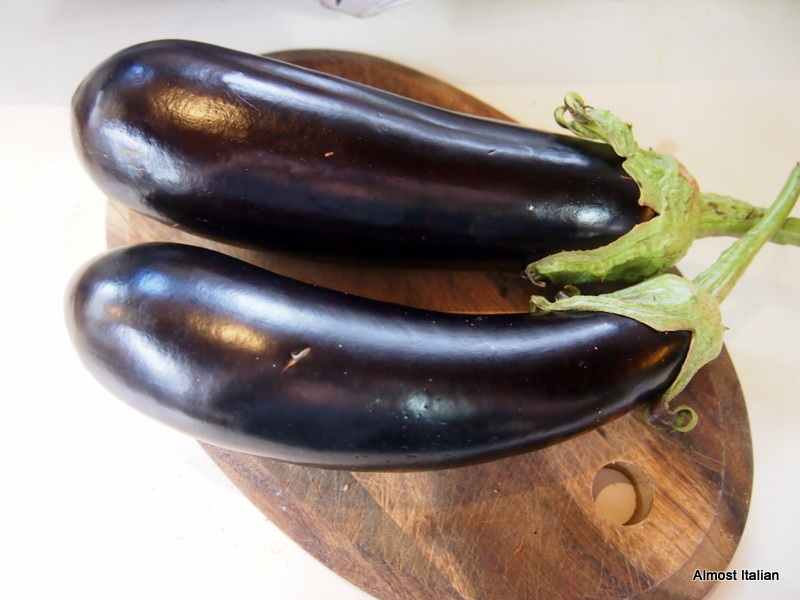 Place an eggplant slice on a chopping board and spoon on a tablespoon ( or less) of the filling. 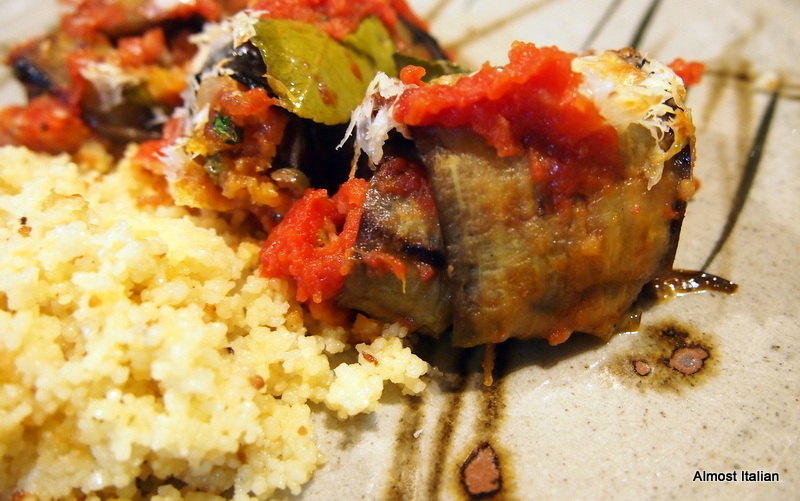 Roll up the eggplant slice and place in an oiled baking dish or terracotta tegame. Repeat with the remaining slices until all used. If there is any filling left, save it for stuffing another vegetable, or just eat it straight out of the pan! Place a lemon leaf between each roll. Pour over the tomato passata and sprinkle over the pecorino. Bake for 30 minutes. *I served mine with lemon couscous. *Gluten free version? Consider using cooked arborio rice instead of breadcrumbs. * Dairy free? Just leave out the cheese. * No pecorino? Just use parmigiano. Also see another version of this dish, using ricotta as the stuffing, produced by the lovely Signorina at Napoli Restaurant Alert. Posted on April 13, 2015 April 13, 2015 Author FrancescaCategories BudgetTags anchovies, aubergine, capers, cuscus, Dominique Riizzo, eggplant, lemon., melanzana, passata, Sicilian, store cupboard, tomato28 Comments on Involtini di Melanzane. Stuffed Eggplant Rolls. 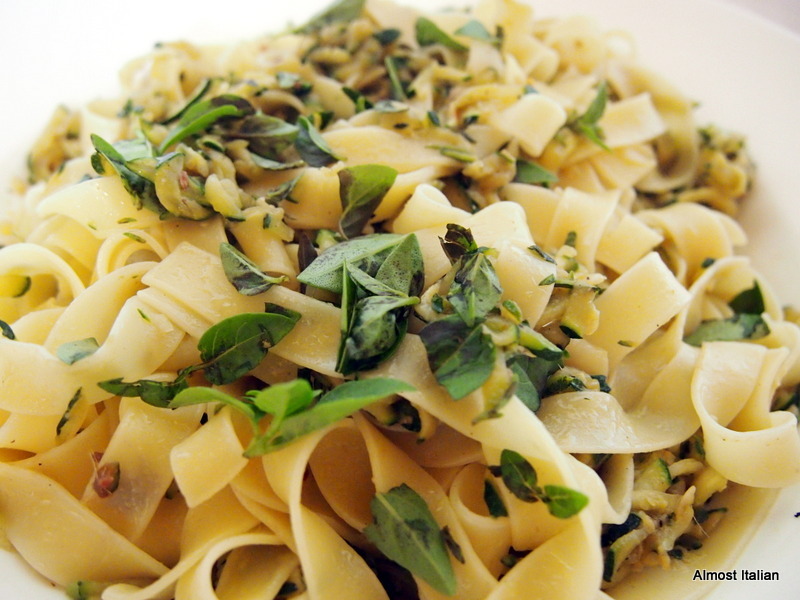 Tagliatelle, with robust flavours from the Mezzogiorno. It is always exciting when the first zucchini of the season appear. That initial joy occurred one month ago. We are still happy about the little flushes, but it pays to be vigilant. Turn your back, and the zucchini turn totally phallic. Large zucchini also sap the life out of the plants, slowing the fertility. It pays to pick often. This recipe is similar to the classic Orecchiette con Broccoli e Acciughe but substituting zucchini for the broccoli. It tastes like the Mezzogiorno, a robust pasta from the south of Italy. 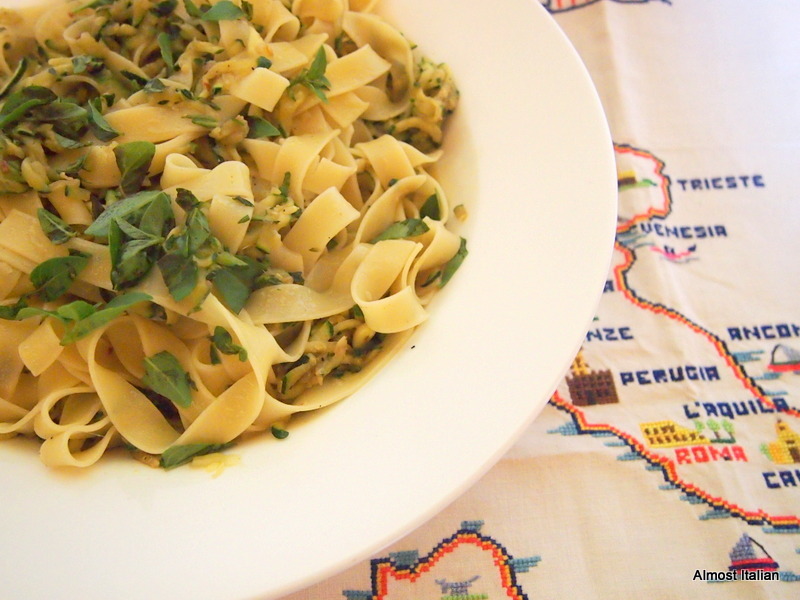 Tagliatelle con Zucchini e Acciughe- Tagliatelle with zucchini and anchovies. 3 garlic cloves, chopped finely. Grate the zucchini on a box grater or with a grating disc on a food processor. Squeeze out the juice lightly. Heat a medium-sized frying pan, then add oil- around 2 or 3 tablespoons. 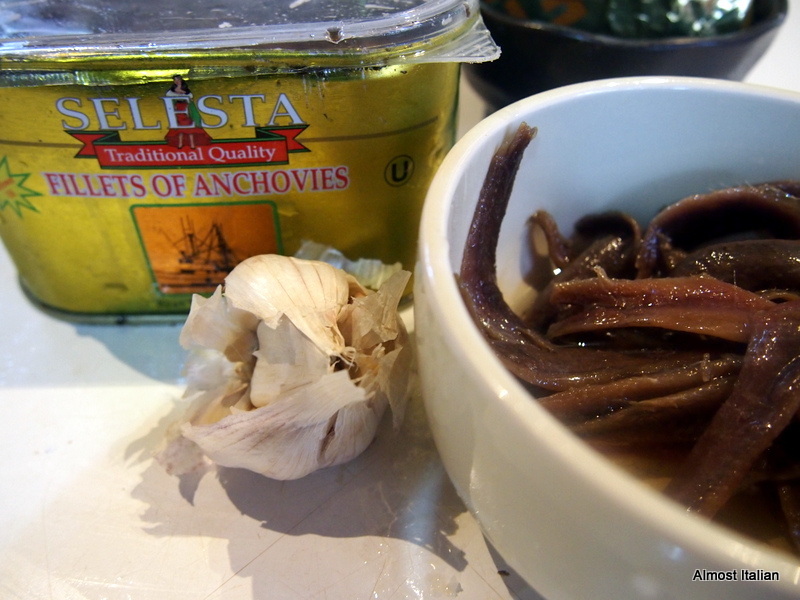 Add the garlic and anchovies, heat and melt the anchovies, then add a sprinkling of chilli flakes to taste. 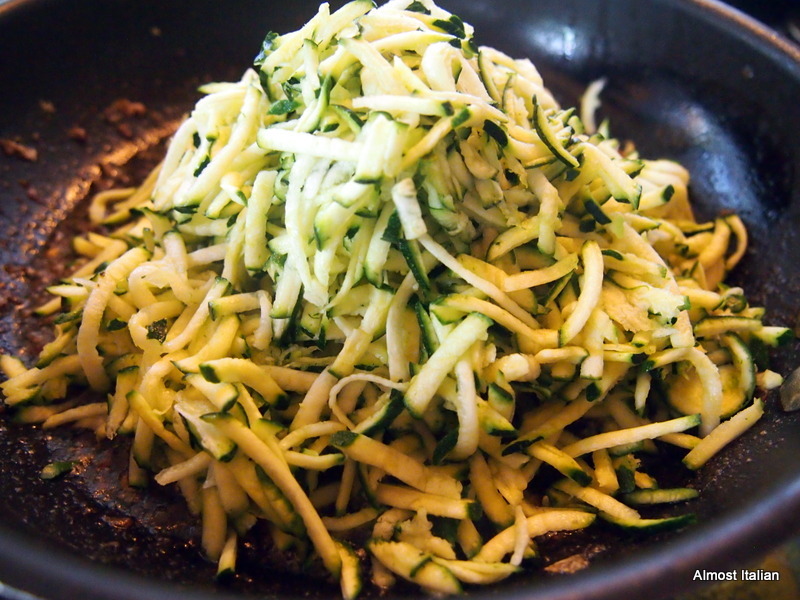 Then add the grated zucchini, toss around well for a few minutes. Cook the tagliatelle nests in ample salted water. Drain, retaining a little moisture on the pasta. Add the pasta to the zucchini and toss around. Serve with torn basil leaves and grated parmigiana. My Favourite Soup. 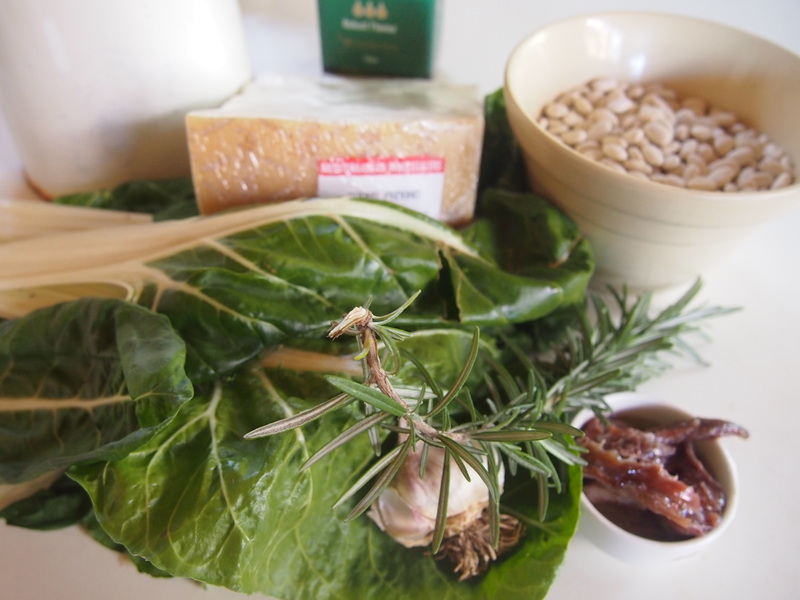 An all year silverbeet recipe. When Leah nominated Marcella Hazan’s The Classic Italian Cookbook for this month’s Cookbook Guru title, I was in two minds. Don’t get me wrong. I went through a Marcella Hazan stage from the late 80s and I believe she has influenced my cooking profoundly. I was studying Italian at the time and her discussion of things like the importance of ‘soffritto’ and ‘salt’ changed my cooking style. At the time, Marcella became my cooking mentor,- I loved the sound of the Italian titles; the two obsessions in my life, Italian language and cooking, complemented each other so well. In those days I owned two other cookbooks written by Marcella. They preceded her The Classic Italian Cookbook which I don’t enjoy as much. So I am sure you won’t mind if I share my favourite soup recipe, taken from her earlier work. This recipe is a family favourite: we have adapted it along the way but it is still close enough to the original. Marcella, I recall, flavours the oil with whole garlic cloves and then discards them. I chop it and keep it all- it flavours the stock beautifully. It has become our ‘chicken soup’, a pick me up. I have attempted to list quantities here: normally it’s a handful of this, a bunch of that and a couple of cups of beans. The beauty of the soup relies on fresh ingredients and it costs almost nothing to make. The costly items are the Parmigiano cheese and good quality oil. 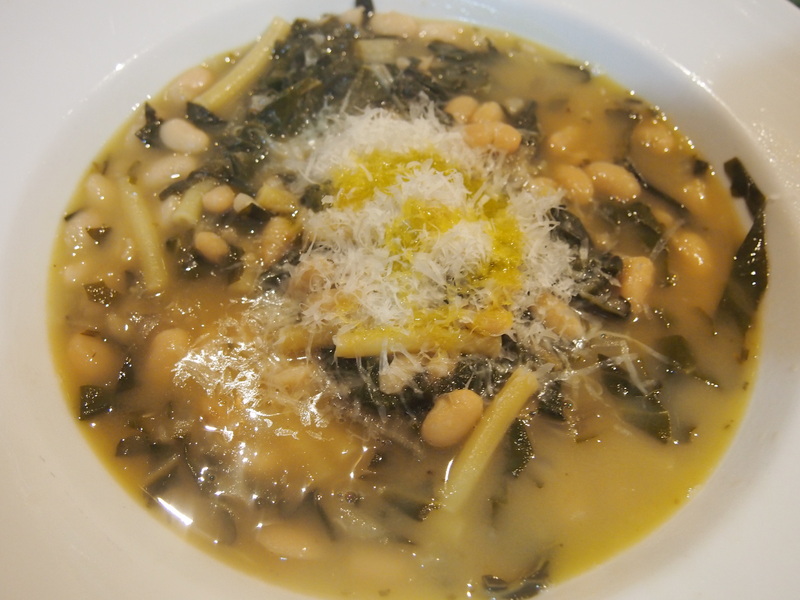 Zuppa di Bietola e Fagioli Bianchi. one small branch of fresh rosemary, stripped, chopped. 4 cloves garlic or more, finely chopped. Make a soffritto with these ingredients in a large pot. Melt the anchovies down in the oil, stirring well, being careful not to over colour the garlic. best EV olive oil for serving. Wash and trim the silver beet. Finely slice, including the stems, and add to the soffritto, stir around and coat with oil till they wilt. Add beans. Add enough water to barely cover ingredients. Cook on a steady heat for around 5 minutes. Add pasta, some salt, and cook until the pasta is al dente. 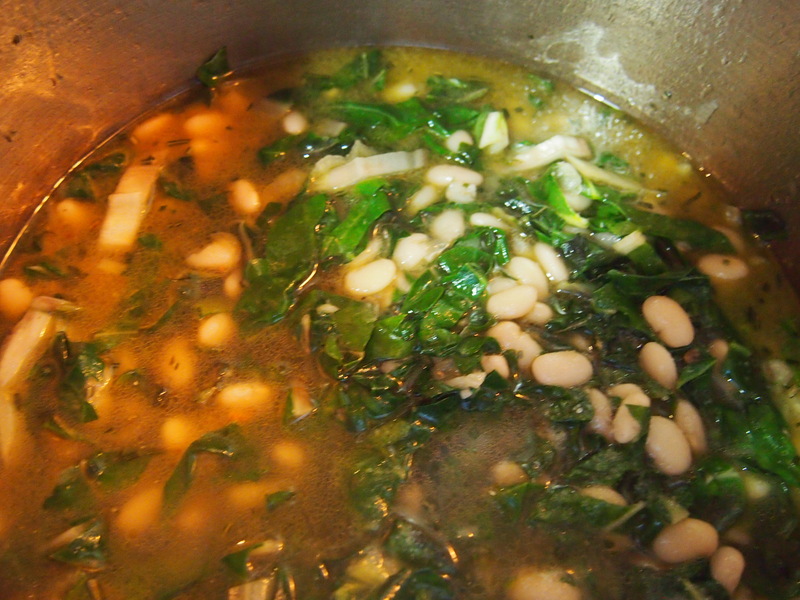 Attempt to obtain a balanced mix of green and white in the cooking pot. Adjust salt, stir some grated parmigiano through the soup. Serve with a little stream of fine oil and extra parmigiano. This is a piatto unico, a one course meal, with good bread. Serves 4-6. 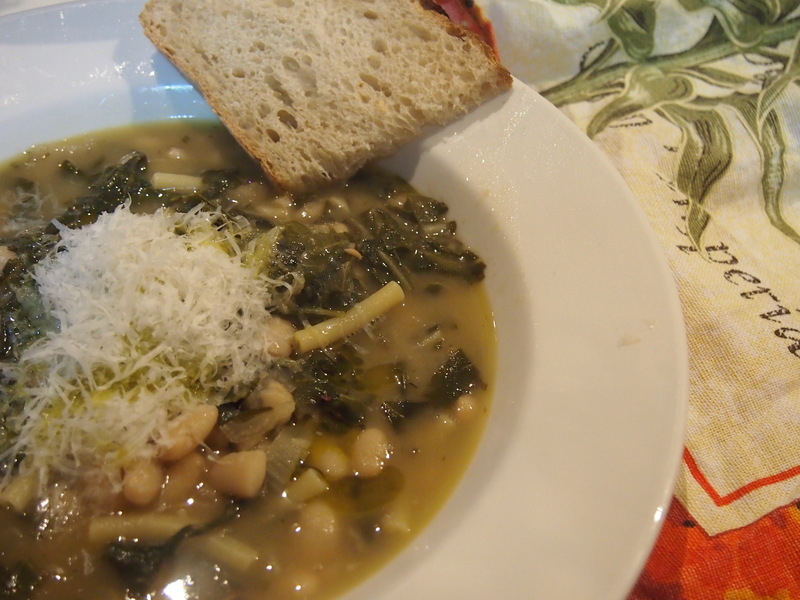 Posted on September 29, 2014 September 11, 2015 Author FrancescaCategories Budget, RecipesTags anchovies, Cucina italiana, garlic, Italian, Marcella Hazan, parmesan, pasta, recipe, silverbeet, soffritto, Soup, Vegetarian16 Comments on My Favourite Soup. An all year silverbeet recipe. This month the fans and followers of the Cookbook Guru are looking at ‘Mrs Beeton’s Book of Household Management‘, first published in 1861 and re-printed many times since then. The book makes fascinating reading and is available online in its original form. 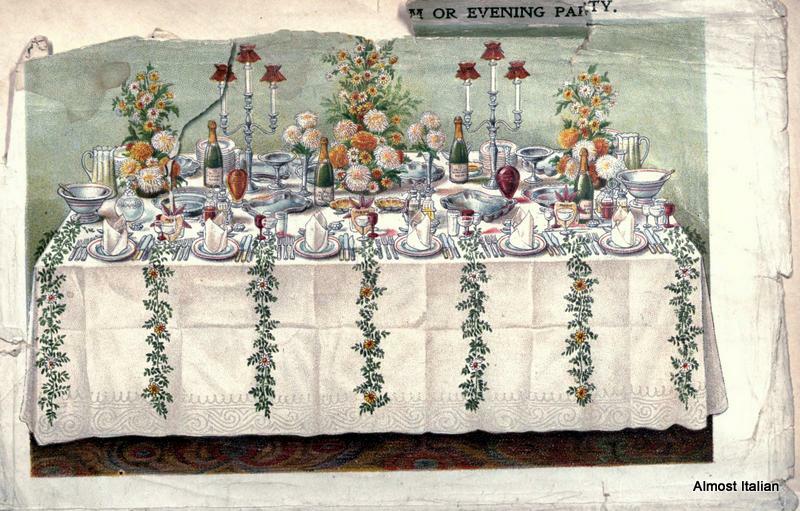 The first section of the book provides insight into household management during Victorian times and the remainder, the bulk of the book, records recipes and seasonal approaches to ingredients. 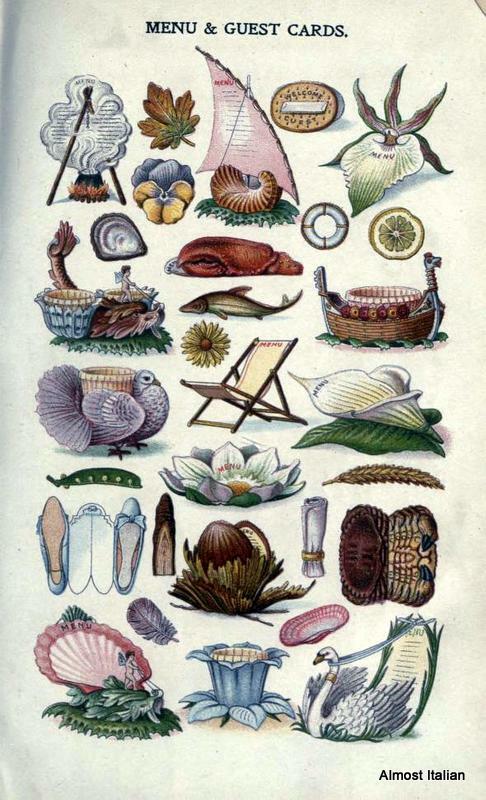 Photos copied from the original Mrs Beeton. Many aspects of this work surprised me. Firstly, her approach to recording recipes and the indexing is quite modern. In this sense, Mrs Beeton paved the way for later seminal recipe dictionaries. Secondly, Mrs Beeton was only 21 at the time of publication, and would have been too young to acquire this depth of knowledge and wisdom, as well as the cooking experience required for such a tome. A little digging reveals that most of the recipes in the book were copied from elsewhere. One thinks of Mrs Beeton as a matriarchal, stern, and pragmatic Victorian woman so it is surprising to find that she was so young, dying at the age of 28 after childbirth complications. Her story makes intriguing reading. Thirdly, the book struck many familiar chords and transported me back to the tastes, flavours and cooking of my childhood, back to the land of English and Irish food, with its economical stews, meats and puddings. 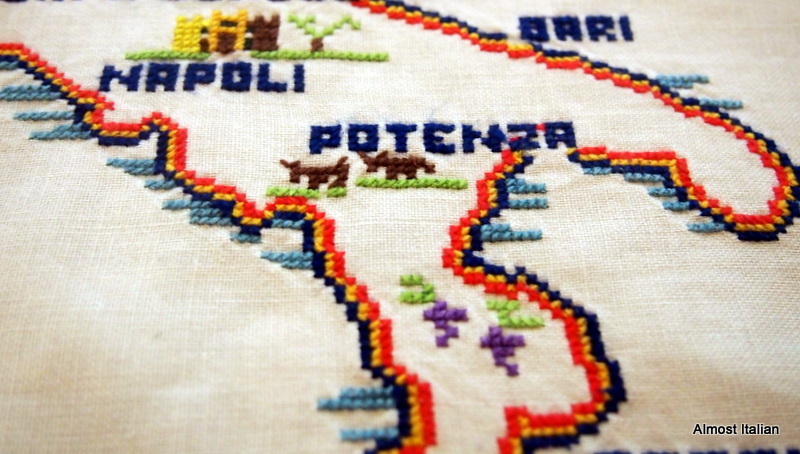 It is a land I rarely visit now, dominated as I am by the food of Italy and Asia. My taste buds are Mediterranean, my location is closer to Asia than anywhere else, but my genetic food memory is still intact. Reading Mrs Beeton has brought on a deep sense of nostalgia and pining for the comfort foods of my past. It is a winter sensitivity and one that I am prepared to indulge in when the wind howls outside and the sun is too shy to appear. Growing up in suburban Melbourne in a time when Anglo food was the only food known to us, we had our own Mrs Beeton living next door. Mrs Ferguson or ‘Ferga’ for short, a prim and pragmatic woman, with a tight perm and an eagerness to chat, was wonderful source of budgetary advice for my young mother in the 1950s. Ferga introduced her to the economical principles of Mrs Beeton, ie, that every meal should have a cost per person and that everyday meals should have a firm budget. My Nanny ( along with Pop) lived in a bungalow in our backyard, due to her health problems. She was also a kind of Mrs Beeton. She was a great cook, using plenty of lard in her puddings and making beautiful barley soups, scones and other treats. She was round, affectionate, and fairly un- Victorian in manner. I used to go on shopping errands for her- mainly to purchase a packet or two of Turf or Craven-A cigarettes. The smokes didn’t help her health! Below- My Nanny in dance costume, around 1910. So now for some real Anchovy Paste. A simple little recipe which I plan to freeze and use on my return from Asia in two months time. I will pop it on some bruschetta, or let it melt over a fine fish, or perhaps stir it through a bowl of pasta. 227. INGREDIENTS.—2 dozen anchovies, 1/2 lb. of fresh butter. Mode.—Wash the anchovies thoroughly; bone and dry them, and pound them in a mortar to a paste. Mix the butter gradually with them, and rub the whole through a sieve. Put it by in small pots for use, and carefully exclude the air with a bladder, as it soon changes the colour of anchovies, besides spoiling them. Average cost for this quantity, 2s. 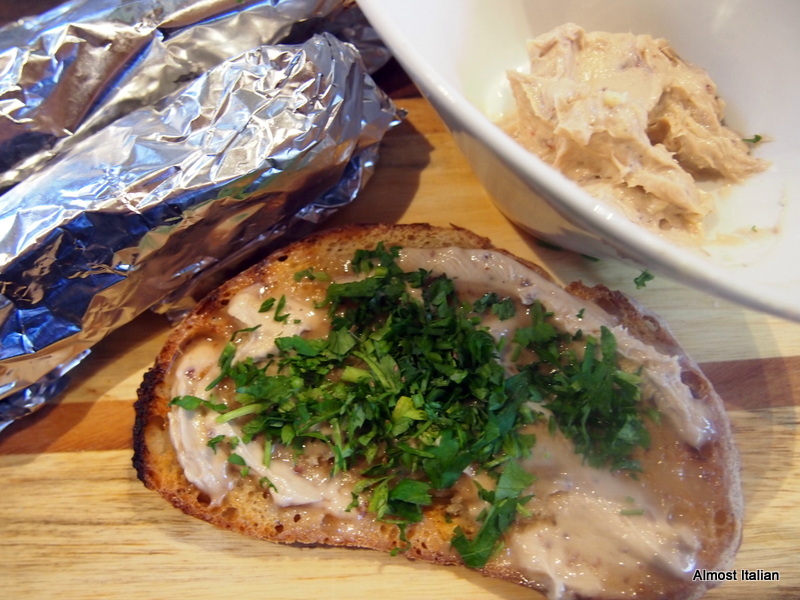 POTTED ANCHOVIES are made in the same way, by adding pounded mace, cayenne, and nutmeg to taste. Pound the anchovies and garlic in a mortar and pestle, then incorporate the butter ( or whizz in a food processor). Roll the paste into logs. Use some now ( yum) or section off into segments and roll in foil, then wrap in plastic zip lock bags, label and freeze for later. Average cost for this quantity in 2014. $1.25. I buy anchovies in bulk at $10.00 for a large tin of 720 gr. ( you can never have too many anchovies). I used unsalted butter at around $1.60 per 250 grams. Mrs Beeton would not approve of the addition of garlic but she would like my budgeting approach. Thanks Leah for the chance to indulge in these memories and for bringing this book to our attention. * As I am following a web copy, my referencing is imprecise with regard to page numbers of quoted text. Apologies to the academically inclined.